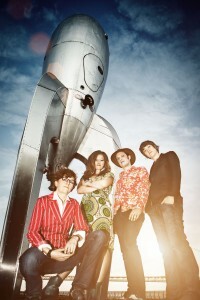 Doris Muramatsu, Nate Borofsky, and Tylan Greenstein, the three founding members of Girlyman, have spent more than ten years playing and singing harmony together. Their journey had brought them from early days in tiny coffeehouses, through long opening runs with the Indigo Girls and Dar Williams, all the way to festival main stages and the country’s premier acoustic venues. The band is now a quartet with the addition of former Po’ Girl drummer JJ Jones in 2009. Murumatsu was diagnosed with leukemia that year, and the band feared for its future, but nine months after her diagnosis, her cancer went into remission and the band was reborn. Girlyman’s new album, “Supernova,” reflects that experience. The songs resonate with themes of uncertainty and transformation. But the album is not a dirge; instead, the band reaches, as always, for hope. “Girlyman doesn’t wallow in such emotions; the band approaches them frankly, capturing, in a story or a surprising metaphor, a feeling you’ve had but never heard so well-expressed,” according to “Slate” magazine. The album features guest appearances by Indigo Girl Emily Saliers, among others. ALMA also helps present music at the Alamosa Farmers’ Market. Sat., Aug. 18 features Flajazzo, flamenco jazz on guitar with Robert Romero and belly dance from special guest Shariffa. ALMA’s gracious members and business sponsors support the free summer “Sundays @ Six,” concerts and other ALMA events.